HERE'S EUROPEAN BATTLEFIELD AT SNELLING MINUS ONLY DEATH HORROR Officers Racing Over Mine Pits and Leaping Deserted Trenches in Relentless Thrust at Enemy Face Tense Reality of Task the Overseas Here are the latest battle pictures to reach Minneapolis. They came right from the front and were taken under exceedingly difficult conditions. Shells are burning to the right, to the left and just ahead. Mine craters and abandoned trenches yawn in the middle distance. But the photographer did not have to go to Flanders or Picardy to get the pictures. They were taken right on Fort Snelling reservation yesterday when the student officers in the training camp got a realistic taste of what is awaiting them on the other side. 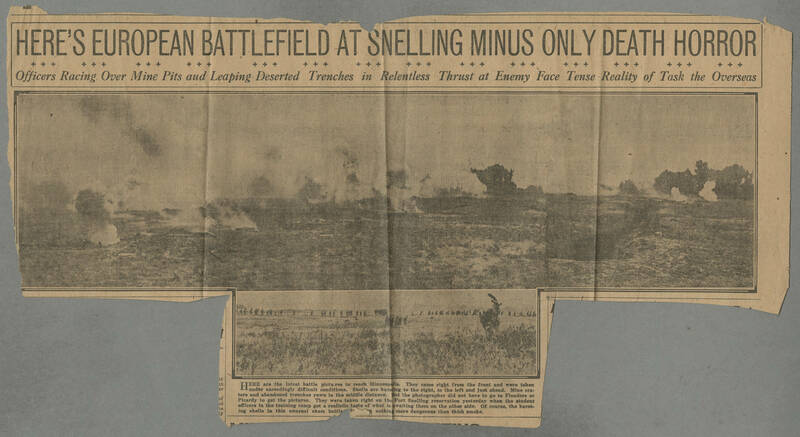 Of course, the bursting shells in this unusual sham battle [illegible] t nothing more dangerous than thick smoke.